I came to Ukraine to document and witness the 2010 presidential elections. To feel the atmosphere I came a month before the elections, and as grim year was ending, voters were getting to pick their president. My last visit to Ukraine was at the end of the year 2004 – when the Orange Revolution was in full spin, where Victor Yushchenko was vaulted to power, when national self-esteem enhanced and hope was raised. But the democratic coalition fell apart and paved the way for revolution villain Victor Yanukovich to possibly win the 2010 presidency. 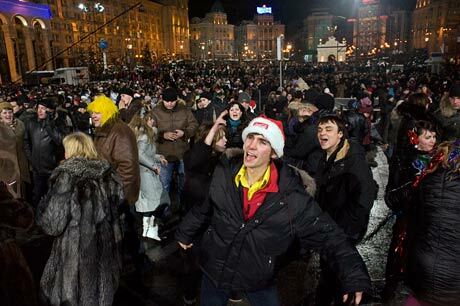 I kicked the New Year with thousands of Ukrainians on Maidan Nezalezhnosti (Independence Square), sipping Ukrainian beer and freezing my feet and hands. The party was organized by the Prime Minister Yulia Tymoshenko, one of the 18 presiden-tial candidates. 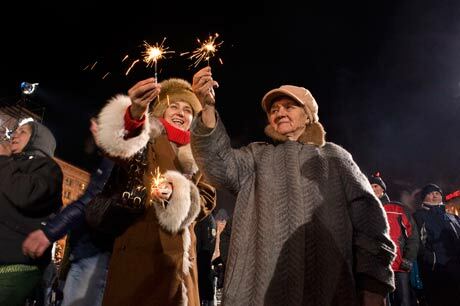 Celebrating the new year on Maidan Nezalezhnosti. People were cheerful and I think they didn’t worry for one night who will be their next president. Anyways, everybody knows there will be second round. Why to worry about the first one. There were 18 presidential candidates, 13 of them minors. A rumor says they are on the payrolls of front-runners and that their candidacies exist to steal votes from top rivals of a leading candidate. Assessments by political analysts show that each presidential candidate will have to spend at least US $150–200 mn to promote himself; this includes buying story lines in the media, visual advertising, canvassing, printing political material and, work with electoral commissions. 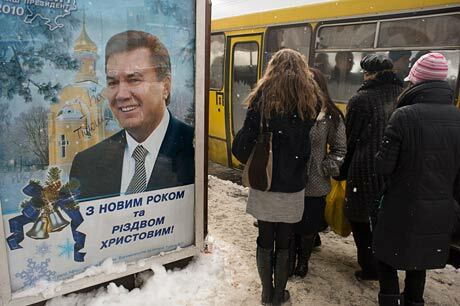 A billboard with a picture of Victor Yanukovich (Party of Regions), one of the candidates running in the 2010 Presidential elections. 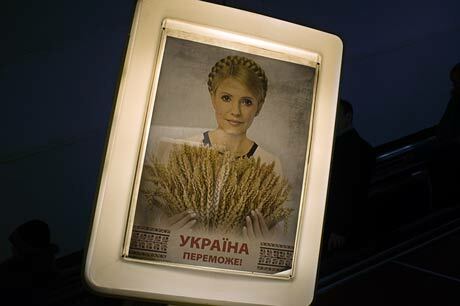 A picture in a metro station of Yulia Tymoshenko (All-Ukrainian Union “Fatherland”), one of the candidates running in the 2010 Presidential elections. 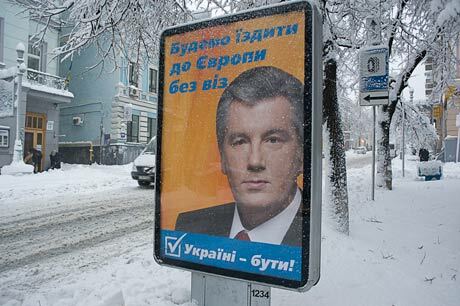 A billboard with a picture of Ukrainian President Viktor Yushchenko (Our Ukraine party), in the build-up to the 2010 presidential elections. One wonders why Ukrainians have their presidential elections in winter. Weather is cold, it snows a lot, and streets are not clean from snow or ice. Maybe this is a tactic; maybe top guys think not many people will go to vote in this kind of weather. 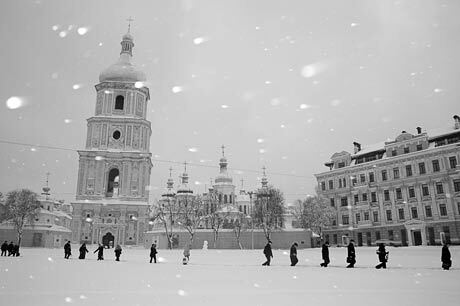 Commuters on their way to work walk past St. Sophia Cathedral, as snow falls over the city. 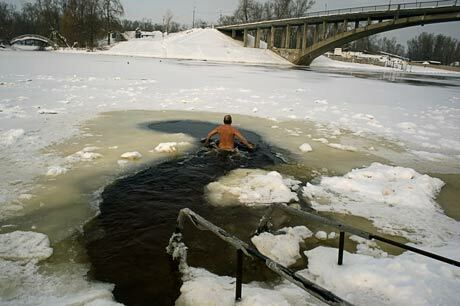 Well, some people love this freezing weather; they even take a pleasure of swimming in Dnipro River. The first round of the 2010 Presidential elections took place on January 17. I can not guarantee that I will continue in my letters. When the presidential elections will start, there will be a very little time for writing.